Inside: Everything you need to know to visit Disneyland with a baby – even a newborn! 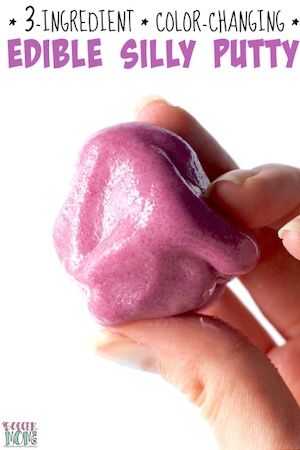 We’ve included shop-able ad links to some of the travel products we love and use. Our disclosure policy is available here. My first visit to Disneyland was at age 33. My youngest daughter just made her first visit at 2 months old! 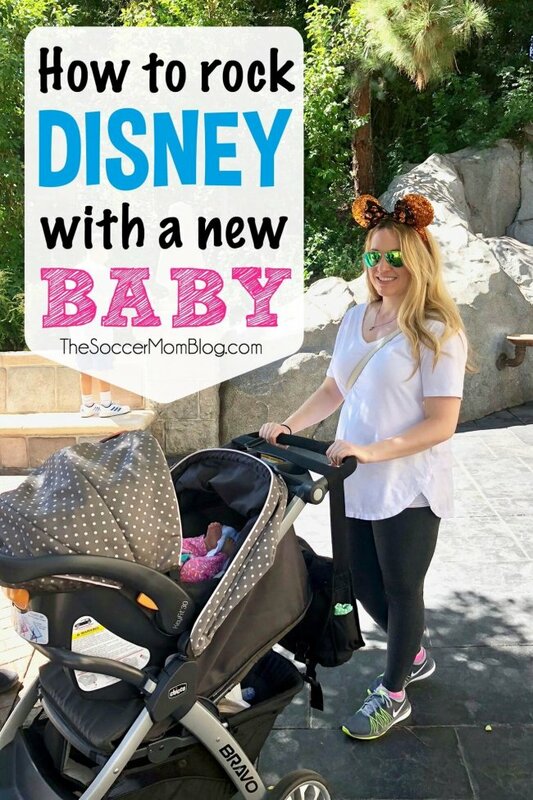 While it might sound intimidating at first to try to visit Disneyland with a baby, it actually wasn’t a big deal at all! Disneyland is very baby friendly and offers a lot of services and facilities to make your trip easier. Here’s what you need to know to visit Disneyland with a baby, without stressing! The first thing that you need to know is that kids ages 2 and under get into Disneyland Parks for FREE! Another money-saver is that kids 2 and under eat free on Disney dining plans. Score! With a newborn baby, a stroller is essential for transportation. The good news is that Disneyland is VERY stroller-friendly! In fact, I’d say that maybe half of the people at Disneyland are pushing strollers (if not more), so you’re definitely in good company. There are also plenty of stroller parking areas outside attractions and restaurants that don’t have room for strollers inside. While there are rental strollers available, we brought our own because that way we could use it to get through the airports during travel. Our Stroller: We have the Chicco Bravo Travel System, and it is the best car seat/stroller combo we’ve ever owned. It’s super sturdy and you literally can unfold the stroller with one hand. TIP: Make sure to purchase a sturdy travel bag to protect your stroller on the airplane. We bought one for our four-year-old’s car seat too…and thank goodness!! Her car seat bag was covered in oil when we picked it up at the gate (grrrr!!) – but at least it wasn’t the seat itself. 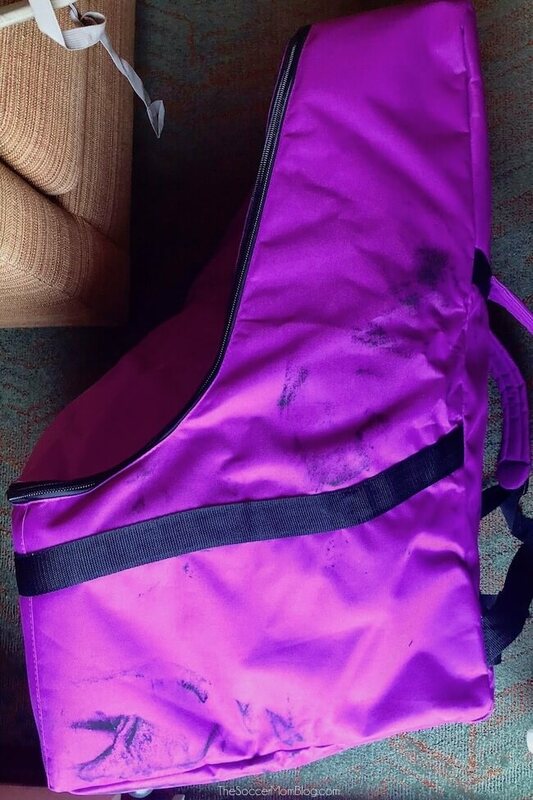 See all those black marks on the outside of our car seat travel bag? That’s airplane oil! This is why we always put our car seats and strollers in bags when we fly. 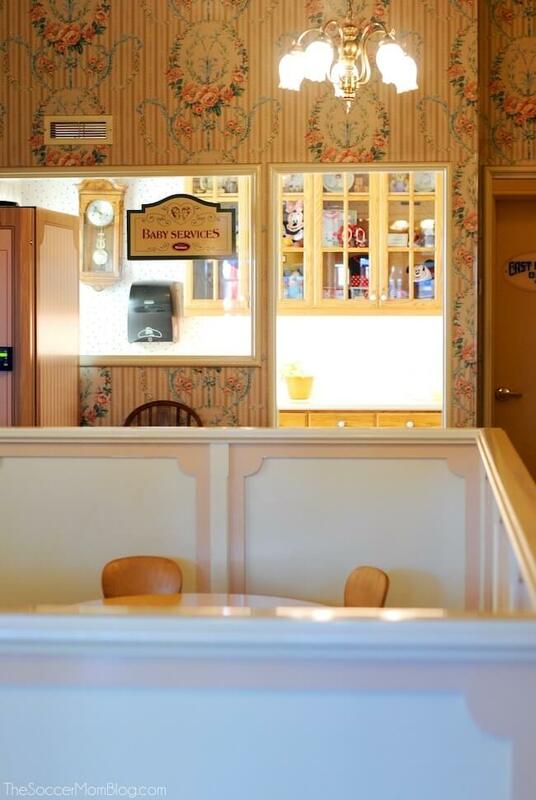 Yes, Disneyland Resort Hotels are a bit pricier than options away from the park. However, when you’re traveling with a newborn baby, it is worth every penny! 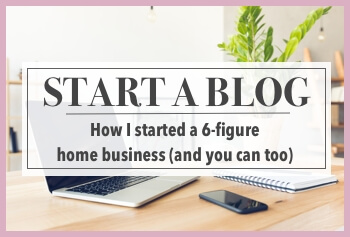 When I visited Disneyland for the first time (while I was pregnant with our 3rd daughter), I stayed with my blogging partner off-site. We had a work event to attend at the nearby convention center, so we found an awesome deal at a hotel next to the convention center that was a 10-minute walk away from Disneyland. As an adult without small children, a 10-minute walk is no big deal. I mean, if you’re going to be walking all day anyway, what’s another 10 minutes? Uber is also readily available in the area if your feet are tired at the end of the day. 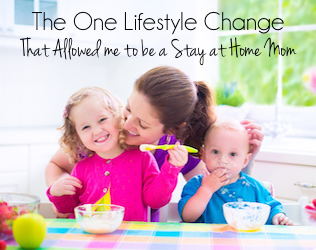 However, it is a different story when you’re traveling with three small children, one of them being a newborn baby. Trying to wrangle all the kids, push a stroller down the sidewalk and cross intersections is a little more stressful. Also, Uber is not really an option because of the car seat situation. 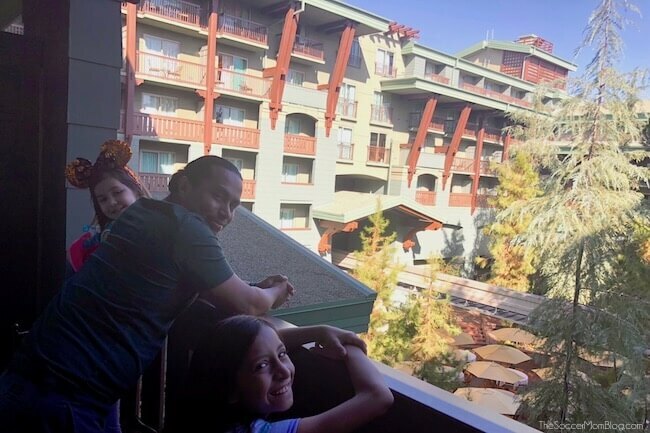 This time, we stayed at the Grand Californian Hotel, which is not only gorgeous, but super convenient! There are direct entrances from the Grand Californian to both California Adventure Park and Downtown Disney. The view from our balcony at the Disney Grand Californian Hotel was stunning! Staying at a Disney Resort Hotel meant that could simply walk downstairs and out into the park each morning. We could also easily drop things off at the rooms or take a midday rest if needed. The other thing I loved was the attention to detail that truly made our vacation perfect. The hotel rooms are immaculately clean, there are plenty of towels, and the soaps smell divine. There are even little footstools so kids can reach the bathroom sink on their own. Disney Resort Hotels are truly magical! TIP: Sign up for Disney’s mailing list, so you’ll be in-the-know for special hotel deals when they’re available. Before our stay, I called ahead to Disney Guest Relations to request a crib for our room. I was surprised that the crib was pretty much a full-sized crib (as opposed to a flimsy travel crib like you’ll find at some hotels). It was on wheels, so we were able to roll it out of the way during the day (instead of folding it up). It was such a convenience to have a safe sleeping situation available for our daughter, without the hassle of bringing our own travel crib. 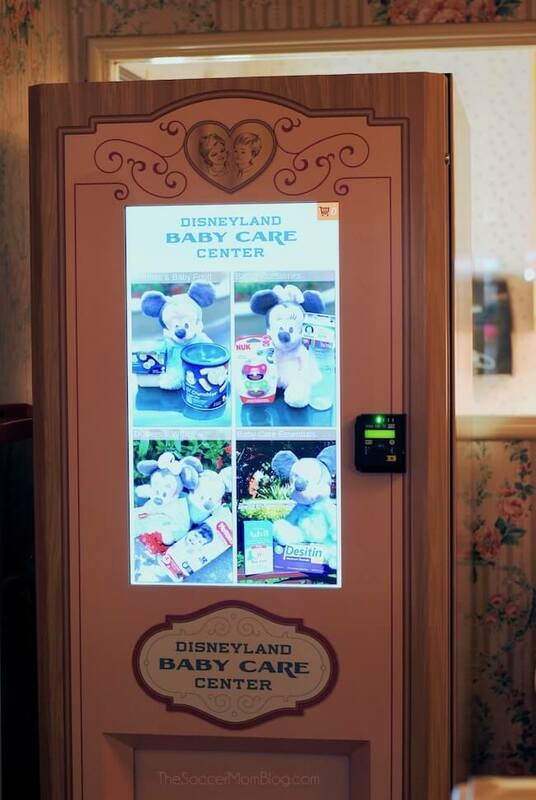 I had no idea these existed when I visited Disney while pregnant — but the Baby Care Centers are total lifesavers!! 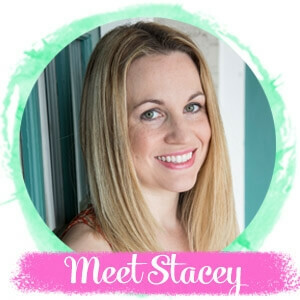 I visited the Baby Care Center in Disneyland multiple times a day to nurse, change diapers, or just enjoy the air conditioning. On one occasion, I brought my four-year-old too because she was getting tired and it offered her a place to sit and rest. Plus there are little toilets so she can use the bathroom easily. Disneyland — at the end of Main Street on the right side (if you’re walking from the park entrance). The Baby Care Center is located on a side street next to the First Aid Station. TIP: If your child ever becomes lost, they’ll be brought to the nearest Baby Care Center. 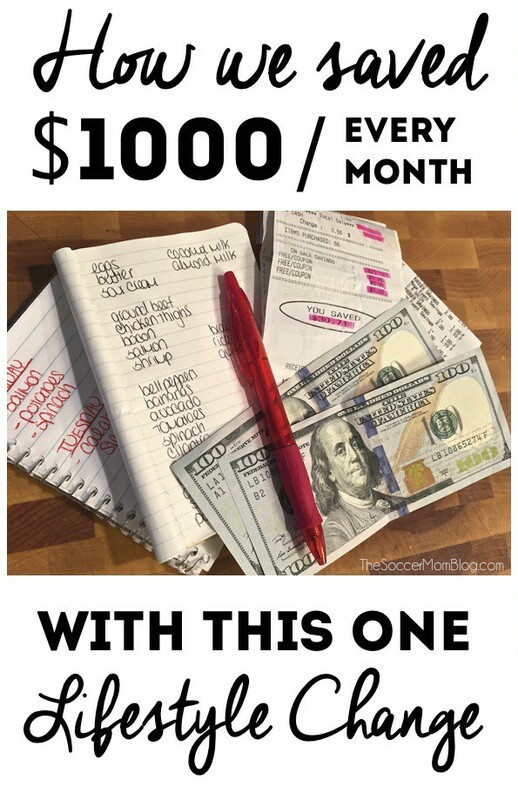 Hopefully this never happens, but it is still good to know! It’s always helpful to have extra hands! Because we had three grandparents and an auntie along for the ride, we were able to split up into groups at times. This allowed the big girls to meet ALL the princesses and check out some of the attractions that the baby couldn’t do. TIP: Babies can go with you on any of the rides that don’t have height requirements – see a list here. 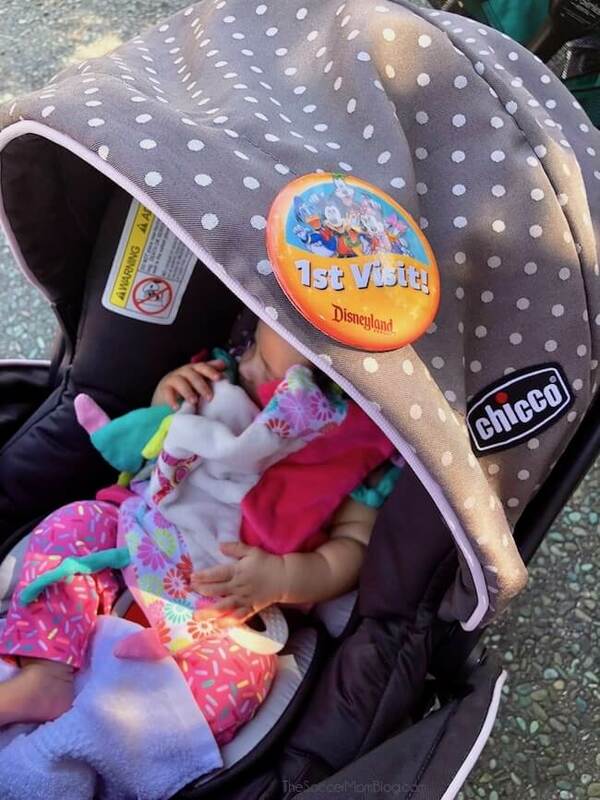 You may be able to use a hands-free baby carrier during some of the rides, but always check with an attendant first. When my husband and I wanted to go on a ride together, we had at least one other grown-up to stay with the baby while we did so. Aside from the extra help, it was more fun to have a lot of family with us! If you don’t want to bring your baby on a ride, or there is a height requirement, then Rider Switch may be your best friend! Everyone who wants to ride gets in line, with baby. When you get to the front, let the attendant know that you want to do a “rider switch.” They’ll direct you exactly what to do, but essentially most of your party rides, while at least one adult waits with baby. When the first half of your party exits the ride, the remaining adult (and anyone who waited with them) gets to ride, while the first riders take over baby duty. I think we will take better advantage of this on our next visit so more adults get to enjoy the rides too! Things take three times as long with kids and/or a baby. However, if you utilize the Disneyland app (it’s free) and FASTPASS or MaxPass, you can save time and get more done. Using MaxPass with the Disneyland app allows you to schedule out some rides in advance throughout the day. During your assigned time, you can skip the main line and get in the much shorter FASTPASS lane. The traditional FASTPASS system is free to use, but you have to find the stations for each specific ride and physically scan your ticket. MaxPass is an additional $10 per day per ticket, but allows you to schedule FASTPASS times from your phone and for your entire group. It’s SO convenient. Through the Disneyland App you can also check ride wait times, locate characters that are out and about for meet and greets, and make dining reservations. If you have any questions about the Disneyland app, FASTPASS or MaxPass, just ask a cast member. They’re super helpful! 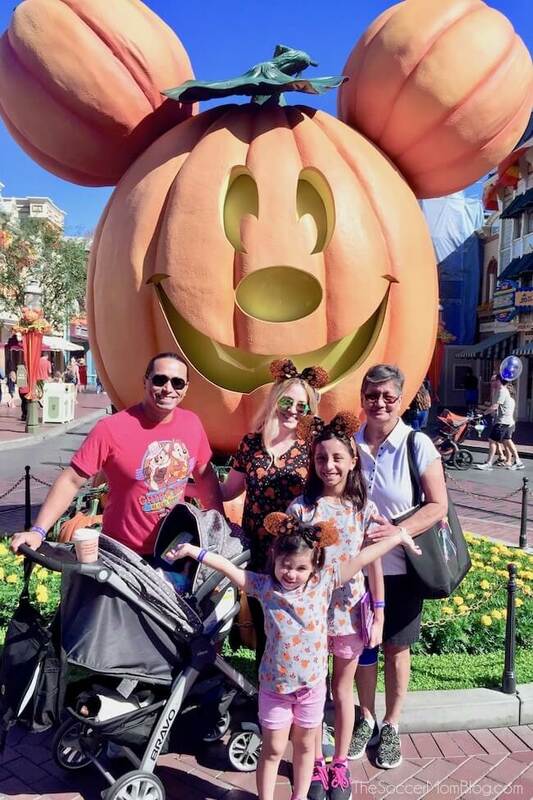 One time we asked someone to take a family photo of us in front of the giant pumpkin Mickey (we visited during HalloweenTime), and she asked if we wanted to move the stroller first. My response was, “no way!” Even though our daughter was napping in her stroller, I still wanted to make sure to include her in as many photos as possible. I love that when I look back at our photos, we are ALL there! 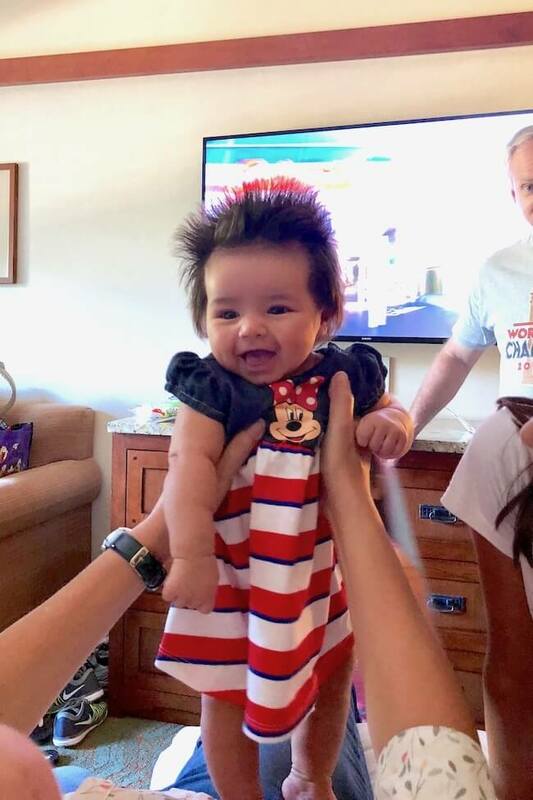 Disneyland with a new Baby is not only do-able, it’s fun! Now that we’ve done it once, I am confident that it will be even easier on our next visit. 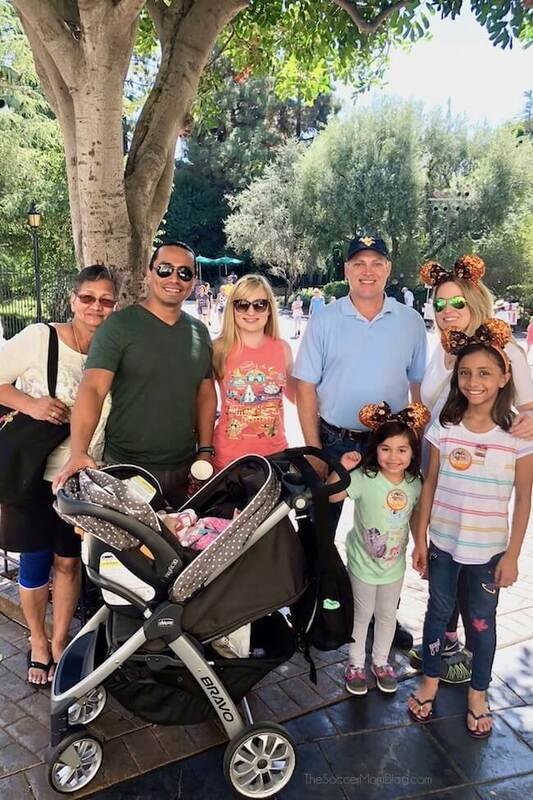 Do you have any tips to add for how to visit Disneyland with a baby? Share them in the comments below! Disclaimer: We received complimentary park admission and discounted hotel rates courtesy of Disneyland. However, all opinions are 100% my own.